Largely overshadowed by the closely contested race for the White House, several U.S. states have voted to legalize recreational or medical cannabis – and the results are mostly in favor of law relaxation. The battle for legal marijuana in the U.S. is mostly fought at the state level, with around half of constitutive units of the nation already allowing medical use while Oregon, Washington, Colorado, Alaska and District of Colombia have already ushered in full legalization despite the standing ban on the federal level. 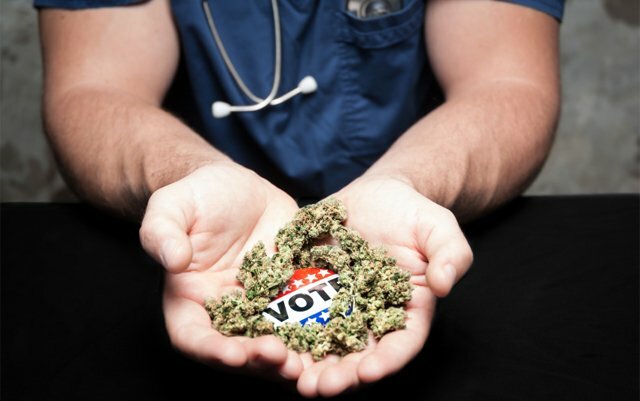 The struggle continued during the recent elections, as citizens of many states were asked to cast their votes on various ballots concerning cannabis legislation. As it turned out, cannabis supporters won the day quite convincingly, with all but one of the initiatives receiving enough support to change the existing laws. This was a state that everyone was focused on, since its huge population and economic power separate California from all other jurisdictions that currently allow recreational smoking of blunts. As expected based on pre-election polls, proponents had a relatively easy victory, with over 56% of voters lending their support to the initiative. Given that California already has a well-developed legal weed production in order to meet medical demand, it would be logical to expect the state to become a major center for large-scale growing in the near future. Nevada joined a handful of other states in the Western U.S. as a place where weed smokers can feel at home. The measure for full legalization was passed with 54.4% of votes in favor, making possession and sales legal with certain limitations. That’s not a huge surprise given that the state derives a large portion of its income from tourism and that it already allows regulated gambling and prostitution, even if it’s not exactly known for liberal politics. Those planning a visit to Las Vegas can now schedule a stop at a green shop before they head out to hit the casino floor! East Coast seems to be catching up with the Western states in terms of tolerance towards marijuana and citizens of Massachusetts made sure their home state leads to way. The proposal to regulate sales of recreational weed was on the ballot in 2016 and received a relatively steady 53.5% majority. The state was relatively late to legalize medical marijuana (2012), so it is fair to ask how well the local government is prepared to take the next step. Without a doubt, pro-cannabis advocates will lend their advice, with hopes that detailed regulations will be hammered out sooner rather than later. It was a very close race in the tiny New England state, but in the end supporters of legal weed claimed another victory – albeit barely. Legalization proposal received 50.1% or ‘Yes’ votes, with the final result being decided by less than 3,000 votes. This was also the last election result to be fully counted, with the rest of America (and the world) following with intense attention. As it turned out, Maine continued the liberal trend seen in most other states regarding the cannabis issue in these elections, but it could have easily gone the other way. Despite the flurry of positive outcomes across the country, voters in Arizona made sure that pro-cannabis crowd doesn’t wipe the slate completely. The ballot initiative that would have allowed adults to grow and use cannabis was narrowly defeated, with nearly 52% casting their votes to maintain the status quo. Such a choice isolates the state from its neighbors to some extent, since nearby states of Colorado, Nevada and California all allow their residents and visitors to light it up without fear of being arrested. In one of the most one-sided battles of this election, voters in Florida came out in overwhelming support for introducing medical marijuana in the Orange State. The support exceeded 71%, as nearly 6.5 million people said ‘Yes’ to Amendment 2 designed to help patients in need of cannabinoid-based medications. That’s a sure sign of progress, although it might be a while before the popular mood turns in favor of recreational use. Location in the so called ‘Bible Belt’ implied that supporters of medical marijuana were facing an uphill battle in Arkansas, since no other states in the vicinity have implemented such a measure. Surprisingly, the bill legalizing this type of use was passed with 53% of the vote, breaking down an important psychological barrier. This victory will likely embolden the activists in the neighboring jurisdictions such as Oklahoma, Tennessee or Mississippi. Montana has a very small population for an U.S. state, so the results were difficult to predict with any level of certainty. However, a medical marijuana proposal garnered impressive 57.6% of the vote, with a nearly 80,000 differential. Thus, patients in this state will be allowed to use cannabis-based products for a number of conditions with a doctor’s slip, which is a fantastic breakthrough for this predominantly rural area located in the Western part of the United States. Few people expected a landslide victory for medical cannabis in North Dakota, but that’s exactly what happened. Officially titled ‘Measure 5’ , the proposition received a whopping 63.7% support from voters, with nearly double number of votes in favor compared to those in opposition. Such a convincing victory is a sign that times are changing and that support for marijuana regulation (at least for health-related purposes) isn’t confined to urban areas on the East and West Coast anymore.